Cameron diaz nose job after surfing accident, If Cameron Diaz ever done plastic surgery? 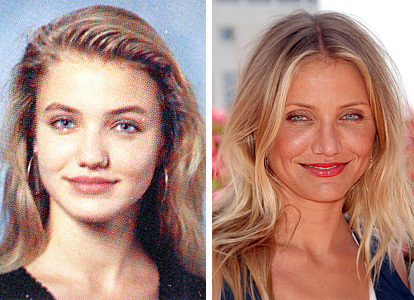 Though Cameron Diaz said she did plastic surgery because of a surfing accident, most plastic surgeon didn’t think so. Dr. Jennifer Walden said: “In the past she has admitted to multiple surgeries on her nose to alleviate breathing problems and to correct a broken nose, somewhat understandable as she is a self-proclaimed “surfer girl”". Now check Cameron Diaz plastic surgery before and after photos below to find the truth! Has Cameron Diaz done nose job? If Cameron Diaz has done nose job? It has been questioned for many years. Cameron didn’t deny it but said the surgery was done because of the surfing accident hap pend in 2003. Wait! from Cameron Diaz’s this photo below (left), you can clearly see her nose not straight! What’s more, if you watch from another side. Her nose shaped changed a huge! Her nose seems much straighter! Celebrity plastic surgeon Dr. Anthony Youn confirmed Cameron Diaz has done septum repair as the nose job. You need to take a close look to see the different. The photos below shows Cameron did have a narrower tip and nasal dorsum before! (right). After the surgery, her nose straighter and narrower! Who did nose job for Cameron Diaz? It’s rumored that Dr. Raj Kanodia did nose job for Cameron and the plastic surgery seems very successful! Dr. Raj Kanodia has been known to be the plastic surgeon for Ashlee Simpson and Jennifer Aniston. It’s rumered Cameron Diaz has done breast implants, from nearly “none” to a A or B cup breast. What do you think? It seems Cameron Diaz had done too much botox or face fillers! You can see the following picture her face looked so fake and ridiculous. Dr. Kenneth confirmed that Cameron had done botox! Cameron Diaz seems to have done a series of nose job. In the following picture, her nose shape seems a little strange right? Also her lip seems not natural. This photo might be taken not long after the accident? Or the photo was edited combining Michael Jackson’s photo? What do you think?